With an expanding global commerce sector, blockchain-based companies are trying to find out new ways to bring new improvements for the benefit of all the people. Build based on a combination between the blockchain technology and artificial intelligence, the SocialGood Cashback is intended to reward users with up to 20% in cash back for the products purchased from partner companies. 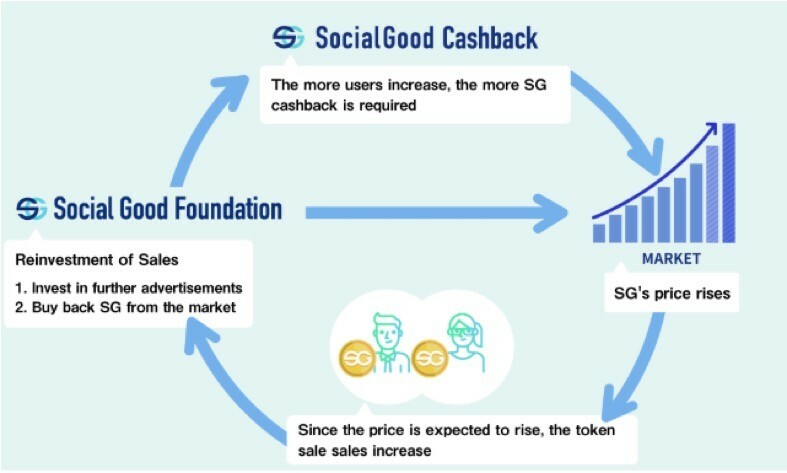 Developed by the Social Good Foundation, the SocialGood Cashback program is made possible through a revolutionary cryptocurrency called SocialGood (SG). A utility token, compliant with the Ethereum ERC-20 standard, SG will have a limited supply of 210 million, a measure which intends to foster a long-term value growth. For 2019, the company plans to issue 17,727,258.918 SG tokens, out of which 10 million or 56% will be used for the Cashback program. The value of SG token is supposed to increase because it has a limited supply and if there will be an increasing number of users wanting to get involved in the system. In addition to that, the Social Good Foundation will reinvest funds raised during IEOs (Initial Exchange Offerings), ICOs (Initial Coin Offerings), and presale, in further advertisement (to increase the number of users) and in buyback-type operations, which will imply that the company will collect SG that are out in the market. Another important step that aims to popularize SG at a global scale will require the involvement of several large exchanges. The company plans to list the cryptocurrency on several big exchanges throughout 2019, and also, sales will begin on the LATOKEN exchange, which has an estimated of $5 billion in trading volume a month. Although the foundation is based in Japan, Japanese residents will not be able to purchase tokens in the first phases of the project. In 2018, the Social Good Foundation managed to raise $30 million from accredited investors, and it had already filed with the US Securities and Exchange Commission in order to be fully-compliant with regulation. Out of the $30 million raised, $10 million had already been devoted for the cash back program, which started at the beginning of March 2019. Throughout the year, the project will continue to expand further, aiming to reach an increasing number of users willing to take place in the program. The Social Good Foundation will also launch a proprietary mobile app, in order to ensure quick access of any user to a personal account. Using the app, clients will be able to monitor their SG holdings, transfer them to an exchange platform and exchange them into fiat money. Although companies from the commerce industry had conducted cash back programs in the past, this is the first time a company involves a cryptocurrency and artificial intelligence. It is expected that operational costs will be significantly reduced, remittance fees will be omitted, and a smooth conversion to fiat currencies will be made possible.